Newsflash: The SUN will be making an extended appearance here, and on a weekend to boot! As I type, I’m listening to the distant rolling thunder and current pitter-patter of rain on the metal roof AGAIN. I’m probably a little over-excited about a weekend of sunshine. Over the last month, I’ve certainly gained a new perspective on my brother’s lifestyle in Seattle and have confirmed that, despite the fact that it is warm and sunny every single time I visit him, I should never, ever live in the Northwest. This extended in-between season has affected menu-planning. I alternate between a Field of Dreams-ish attempt to summon summer (if we grill things, it will come) and hunkering down with comfort food. 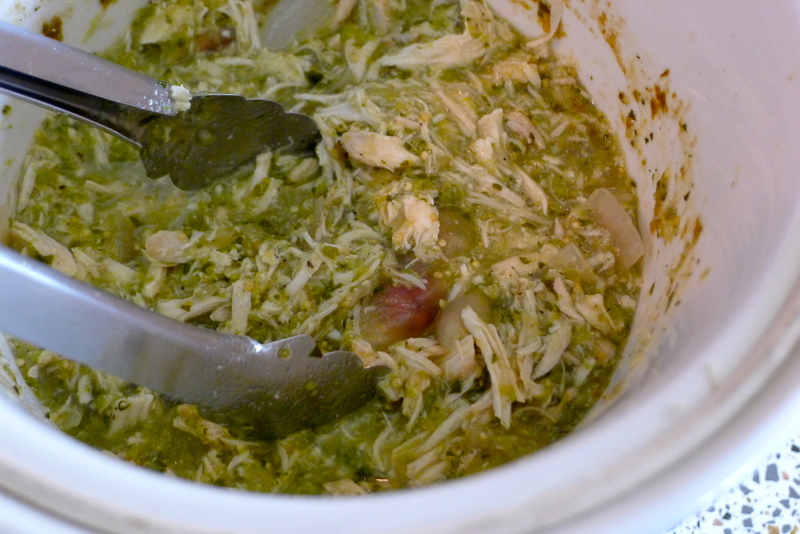 Last week, when I spotted chicken and salsa verde in the freezer (and a downpour in the forecast), I pulled out the crockpot. 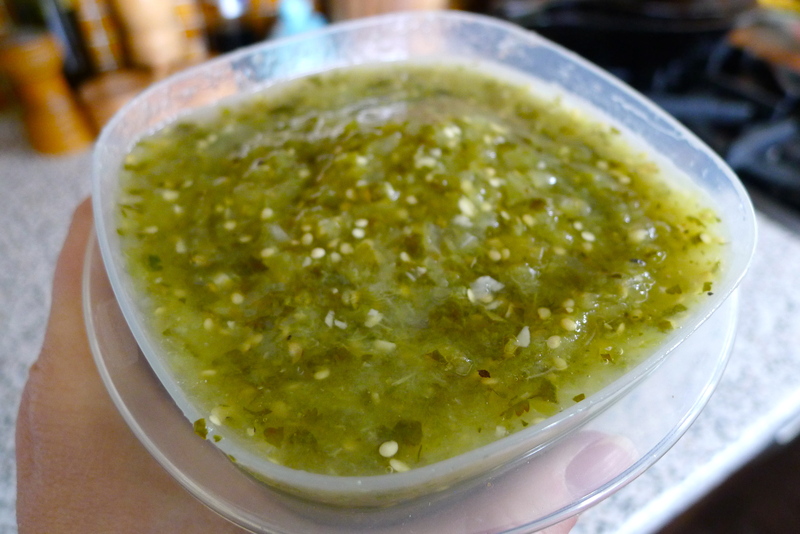 Do you remember when I made the salsa verde? 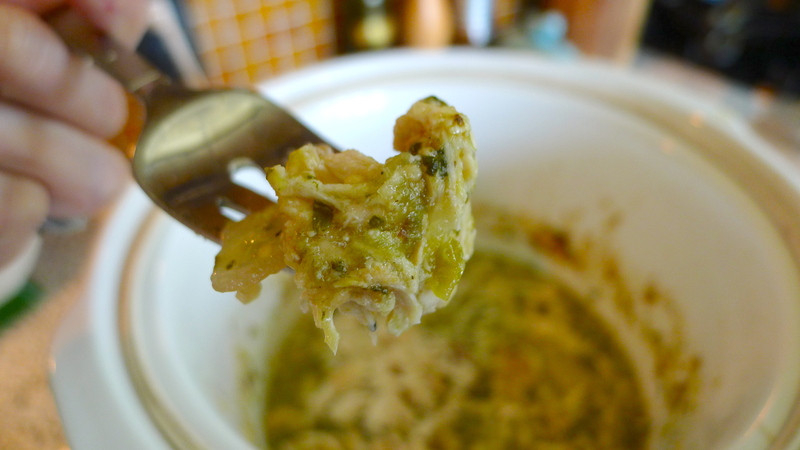 It was a surprisingly simple recipe, took hardly any time, and was easily freezable. 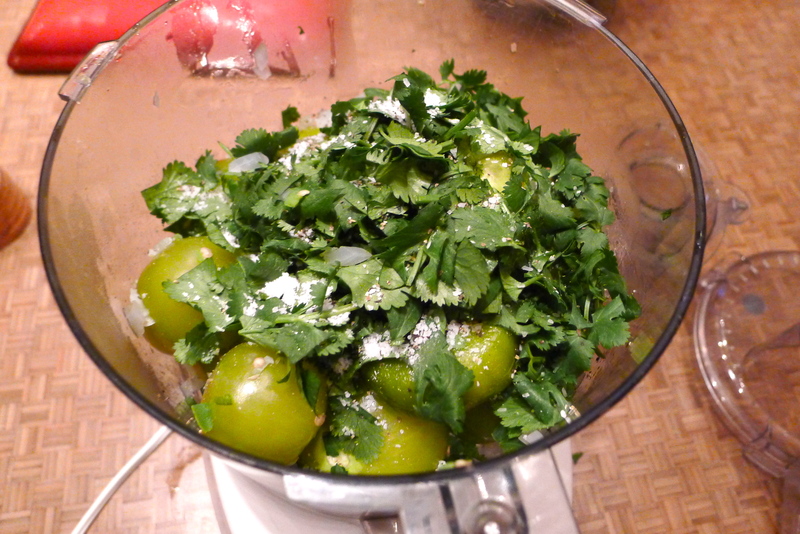 I just simmered some peeled tomatillos with onion, hot peppers, and seasonings, and then blended them with cilantro in a food processor. 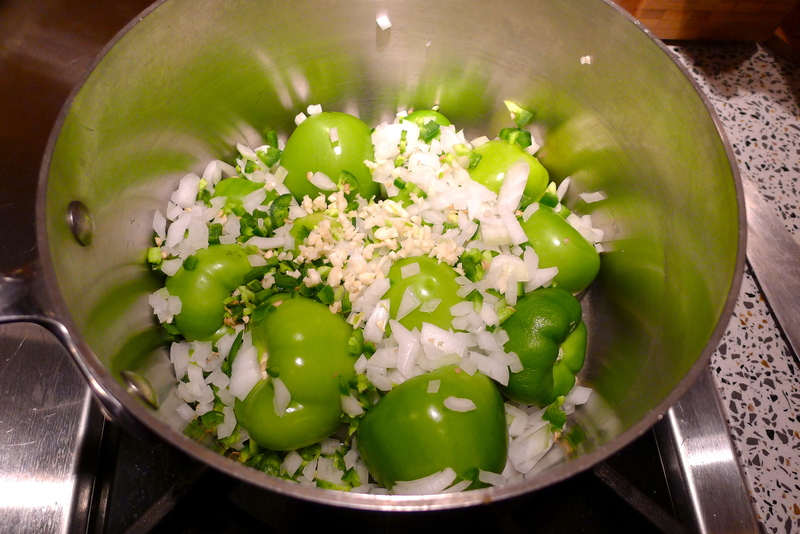 On this day, it would be the sauce for crockpot chicken chile verde. 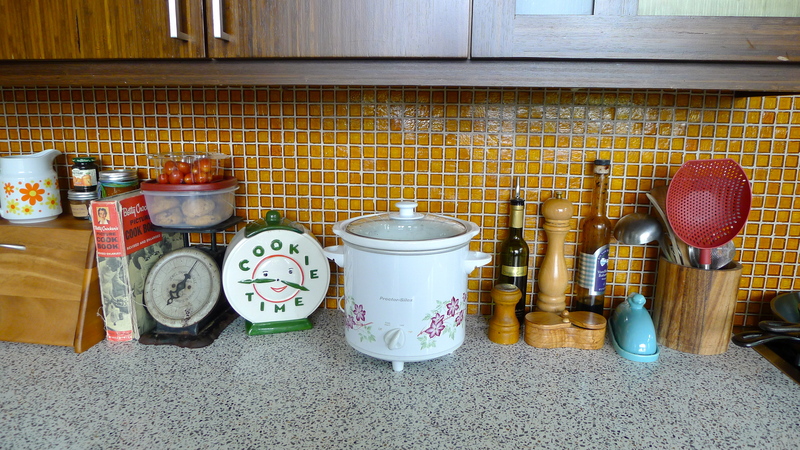 The crockpot is a miraculous little appliance- it makes dinner for you. 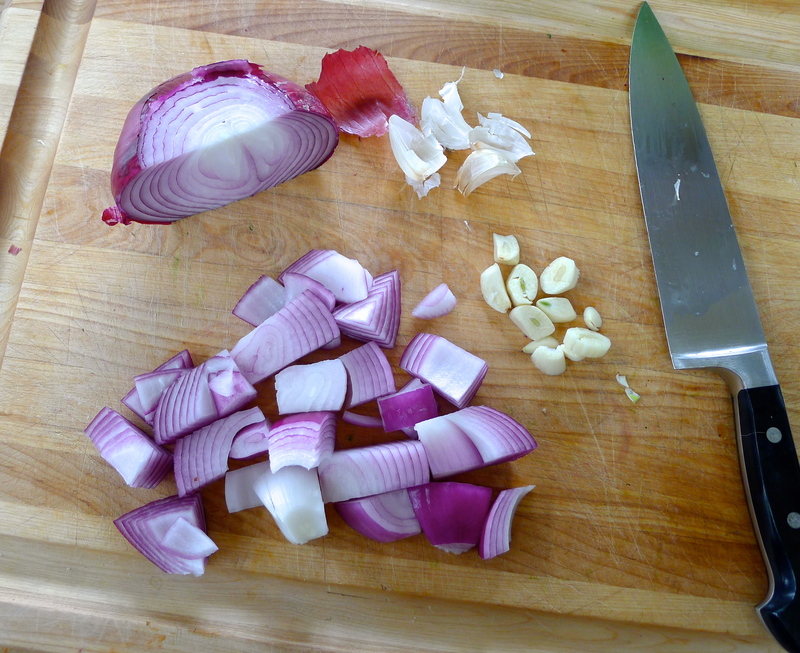 I chopped half of an onion and a few cloves of garlic. 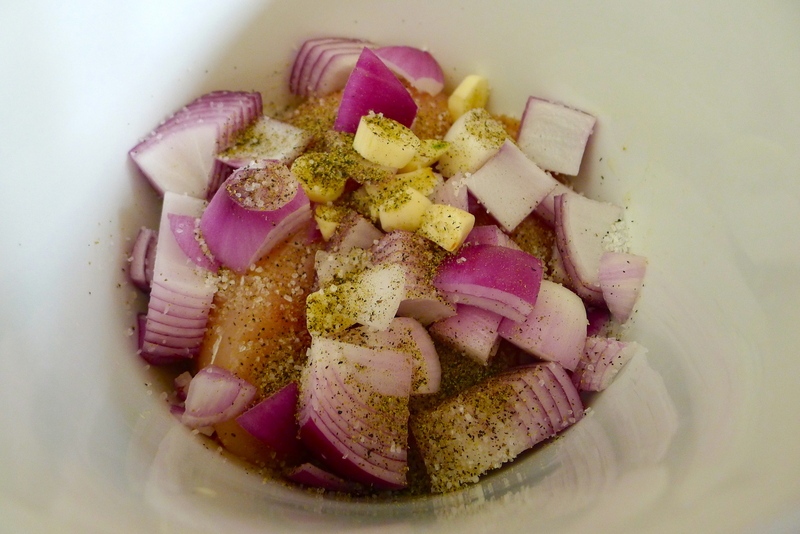 They went into the crockpot with two chicken breasts and a generous pinch of salt and pepper. 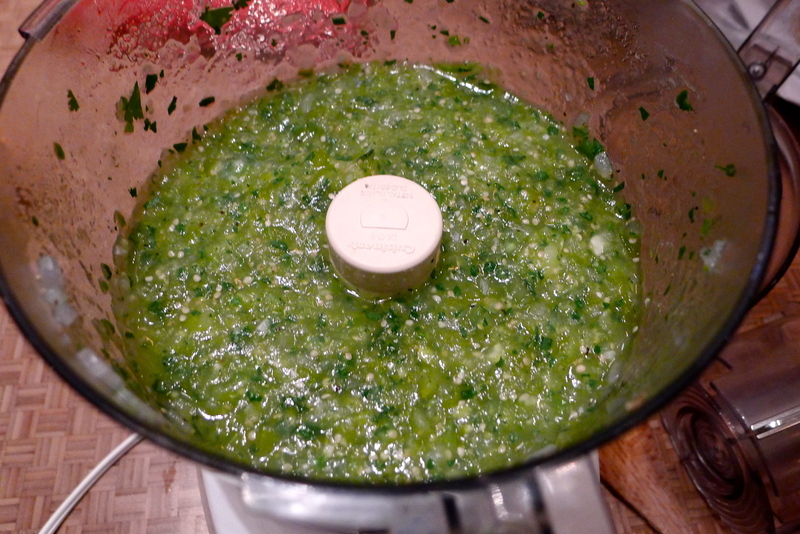 Then I poured the salsa verde right over everything, and popped a chicken bouillon cube in for extra flavor. 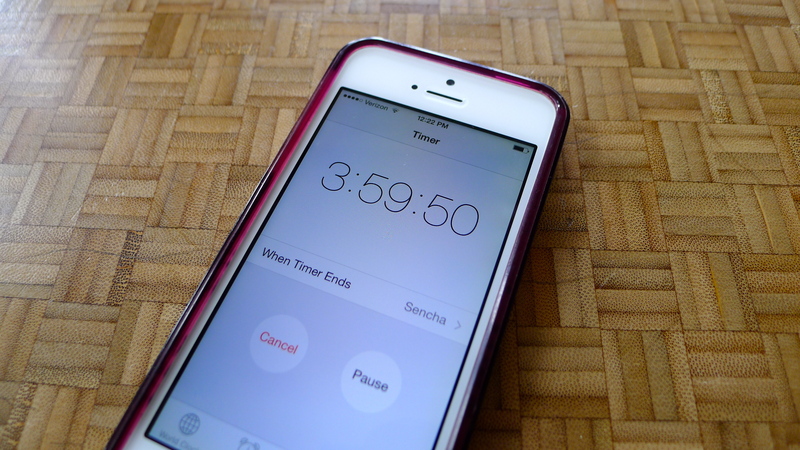 In a matter of minutes, I was done! 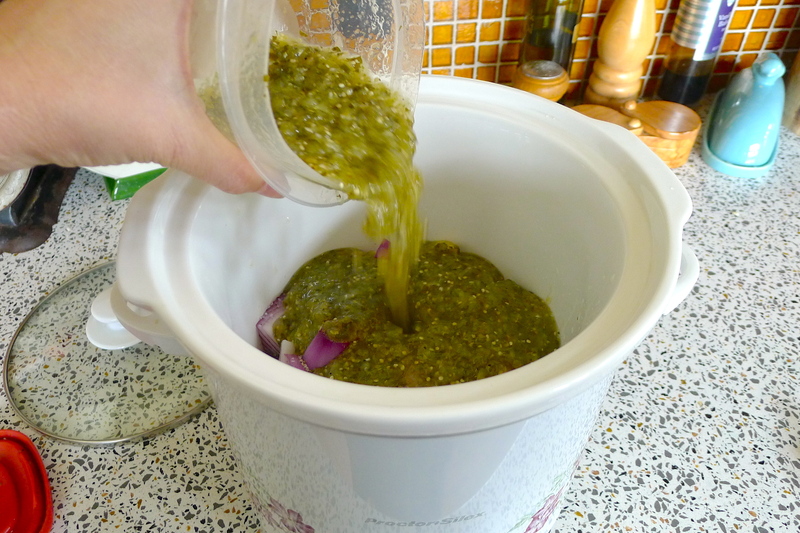 I set the crock on low and let it do its thing for 4 hours. 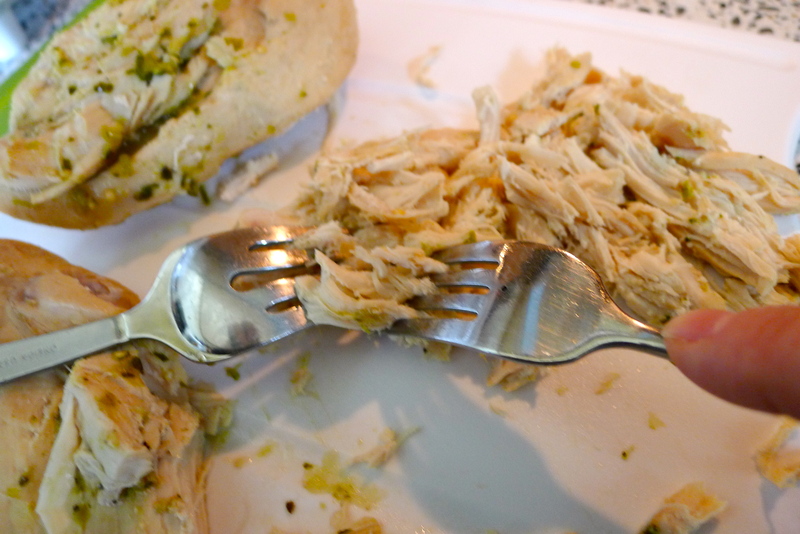 When the timer went off, I pulled out the chicken breasts with some tongs and used two forks to easily shred the meat. 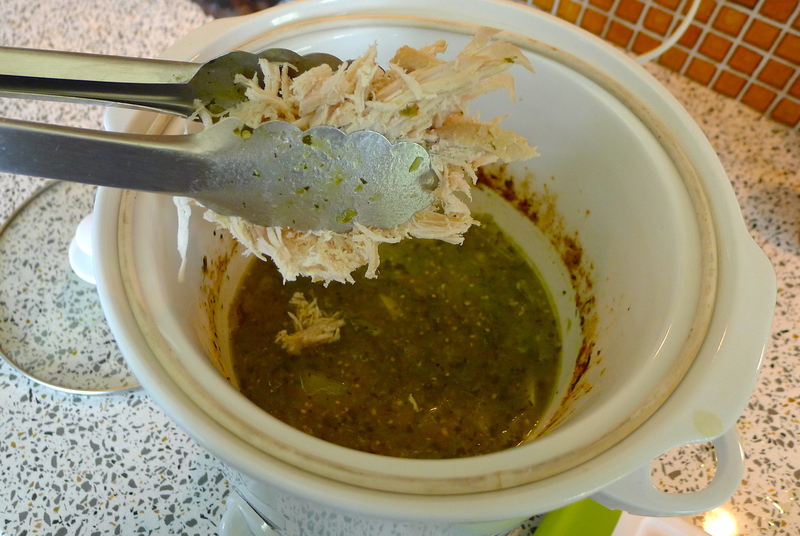 The shredded chicken went back into the crockpot, full of the salsa verde, for another half an hour or so. 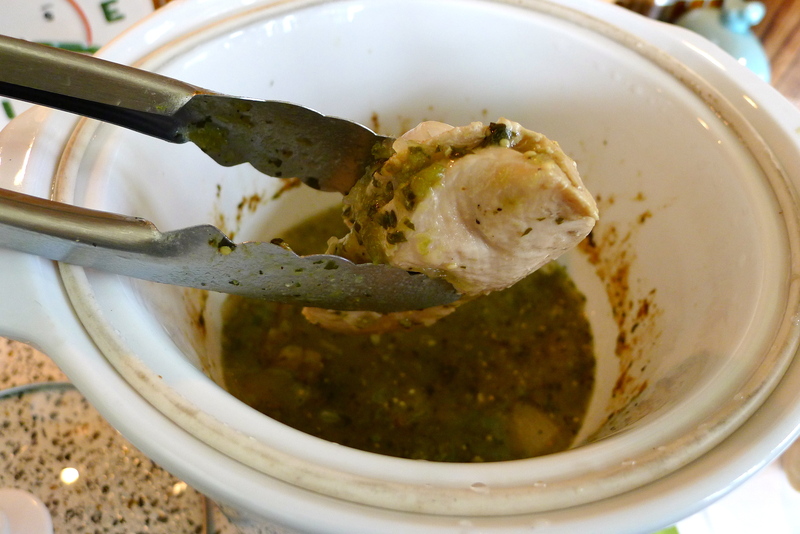 I snuck a taste of the saucy chicken; it was spicy and flavorful and tender and delicious. 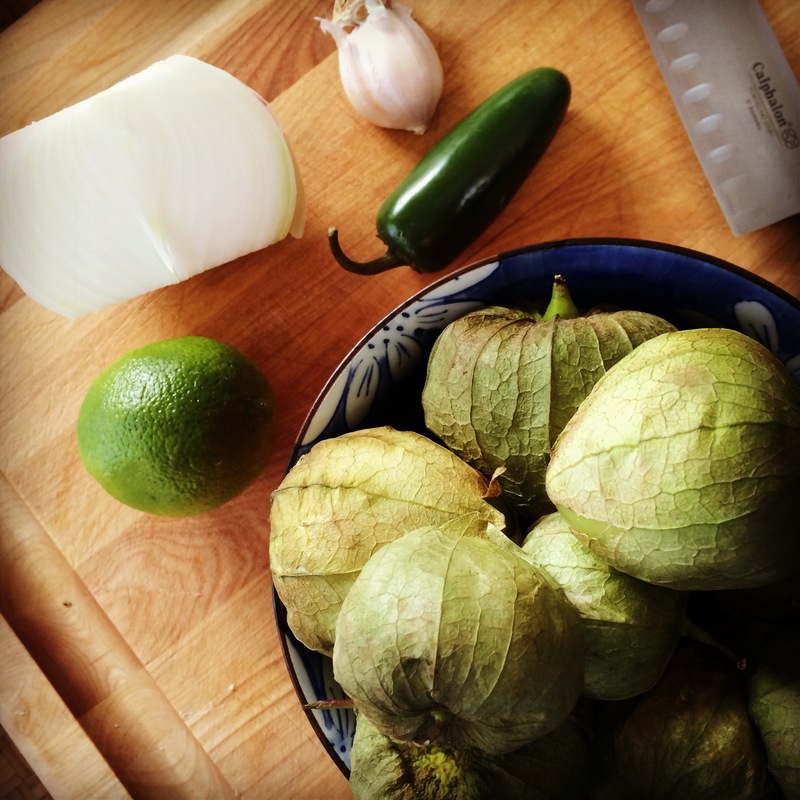 At this point, a fabulous chicken chile verde dinner could have been served, scooped over a bowl of rice with a tortilla on the side, maybe some shredded cheese on top. 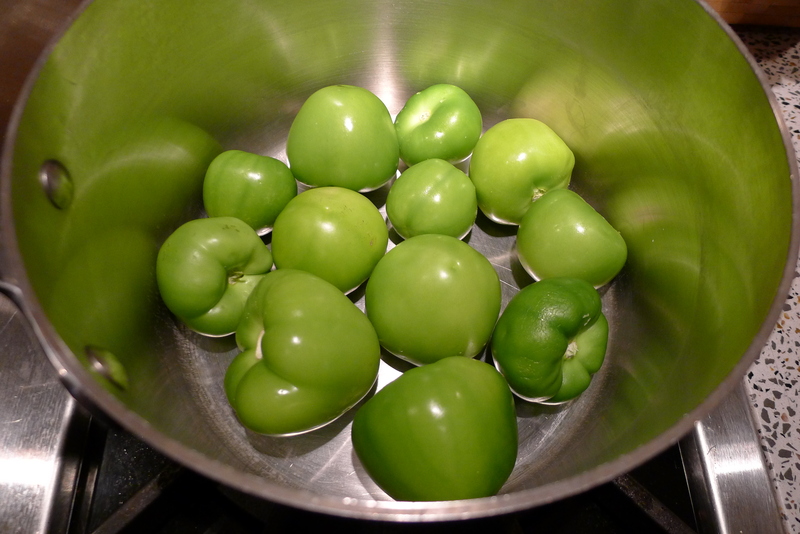 It would also be perfect in a taco or burrito, on a salad or nachos. 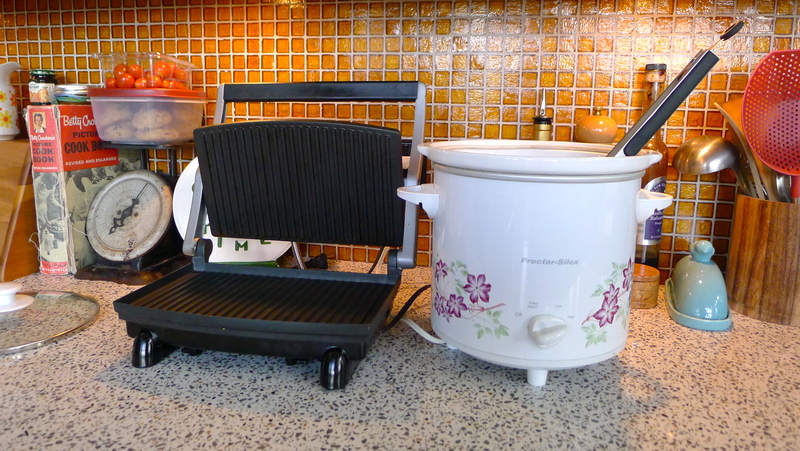 But we had bigger plans that involved another of our favorite kitchen gadgets: our panini-maker. 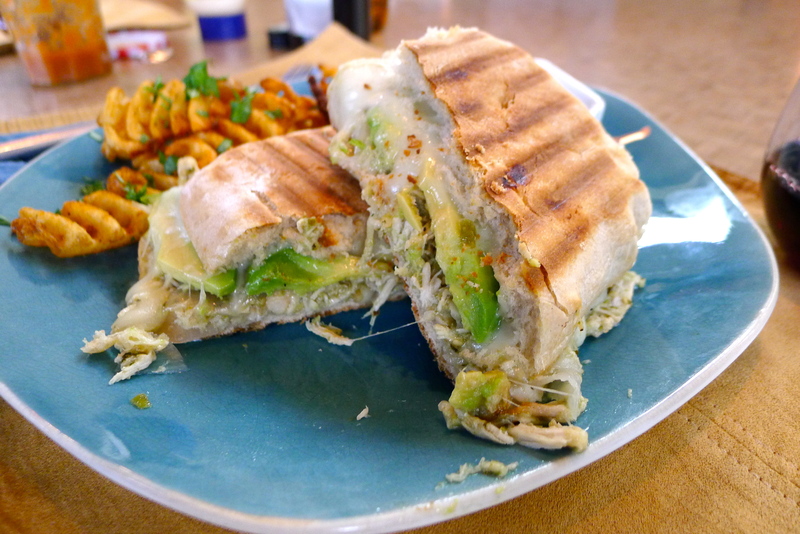 We’ve had fun with cuisine mash-ups this year, and had finger-licking success with another Mexican/Italian panini attempt. 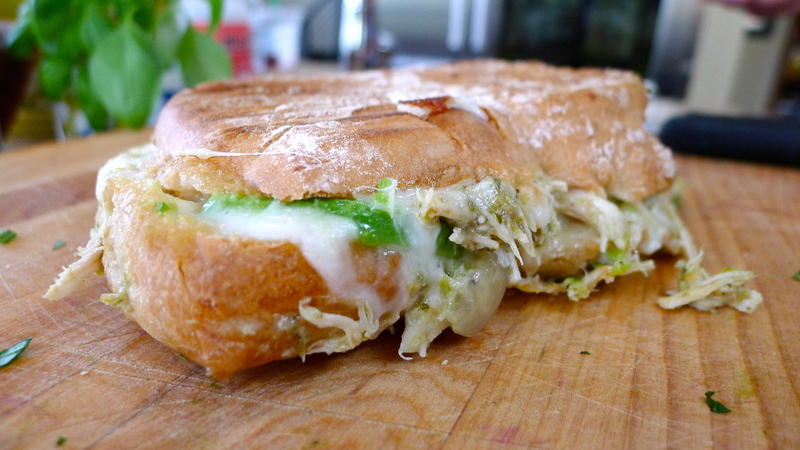 And how good does a chicken chile verde panini sound? 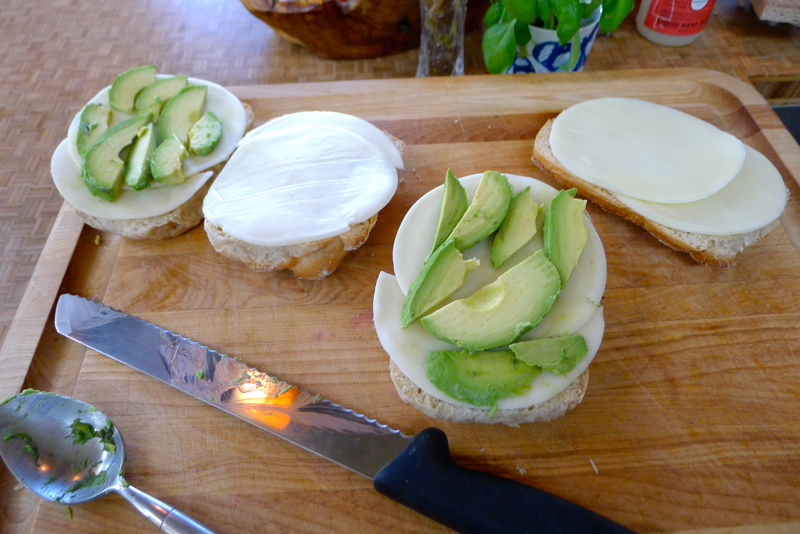 I laid sliced provolone on thick pieces of ciabatta bread and sliced an avocado onto one half. 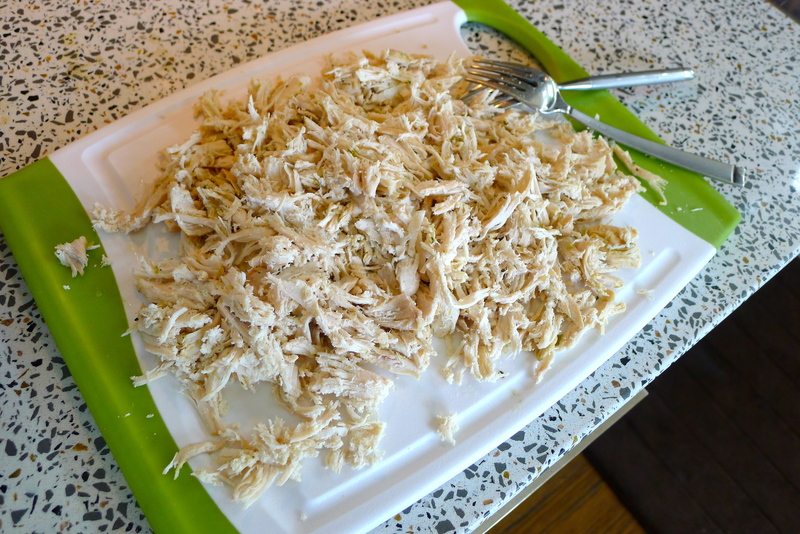 After letting some of the liquid drain off, I piled saucy shredded chicken onto the other half. Into the Griddler it went, to get crisp and toasty on the outside and warm and melty on the inside. 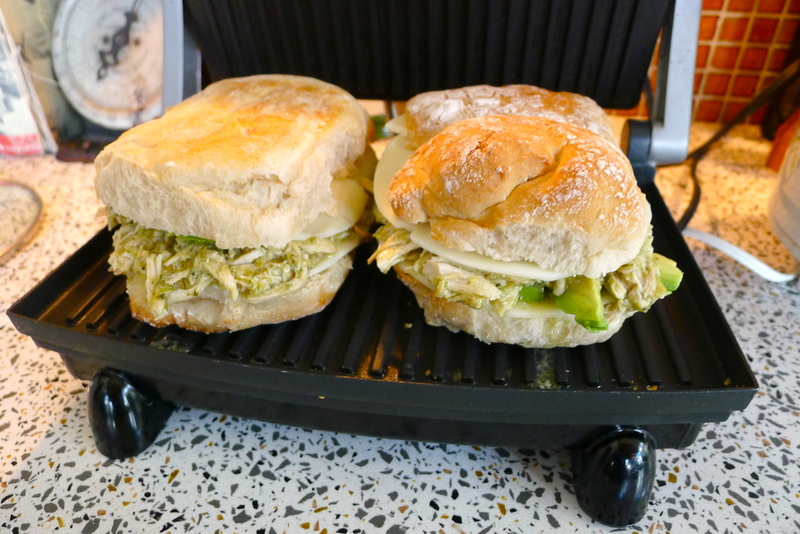 If you don’t have a panini-maker, a grill pan or even a good skillet would work fine. Once again, our mash-up turned out to be delectable. 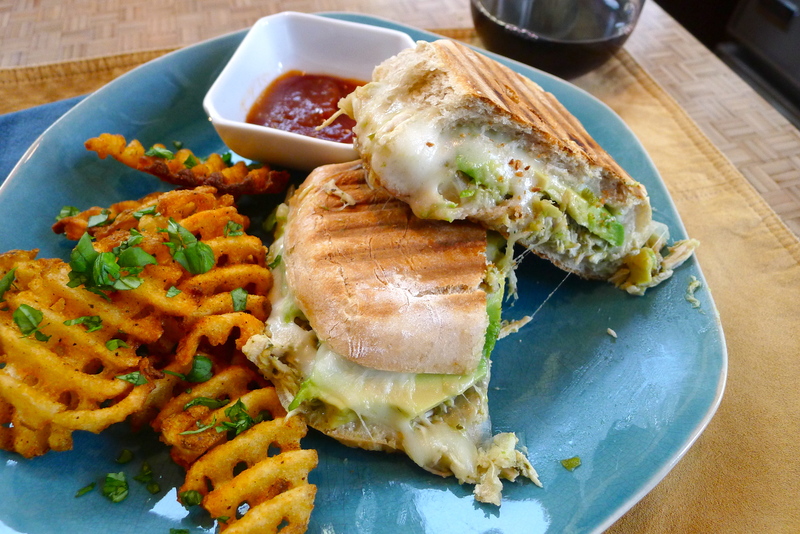 The sandwich was kind of a chile verde burrito and grilled cheese hybrid. While the soft ciabatta worked well enough, an even crustier bread would have held up to the sauciness of the chicken a bit better. Squeezing some of the liquid out of the chicken before adding it to the sandwich is important, too, so things don’t get soggy. 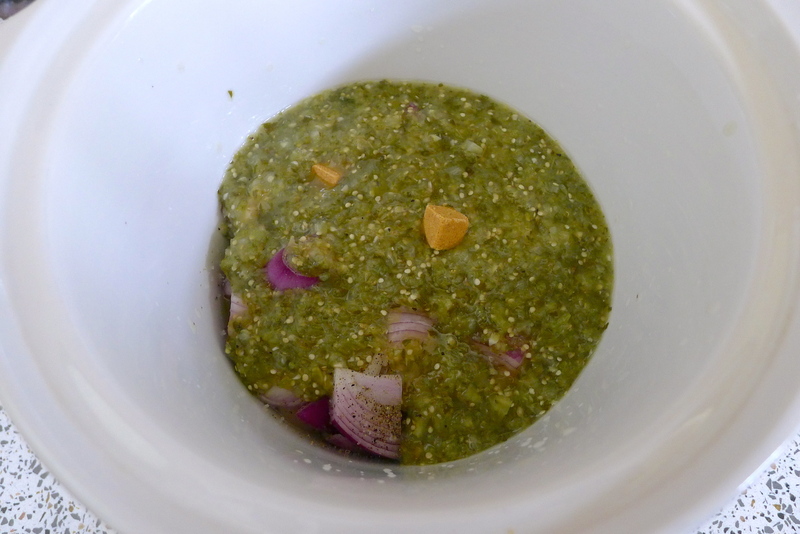 The trick is to put cheese on both halves of bread to create a barrier from the salsa verde. 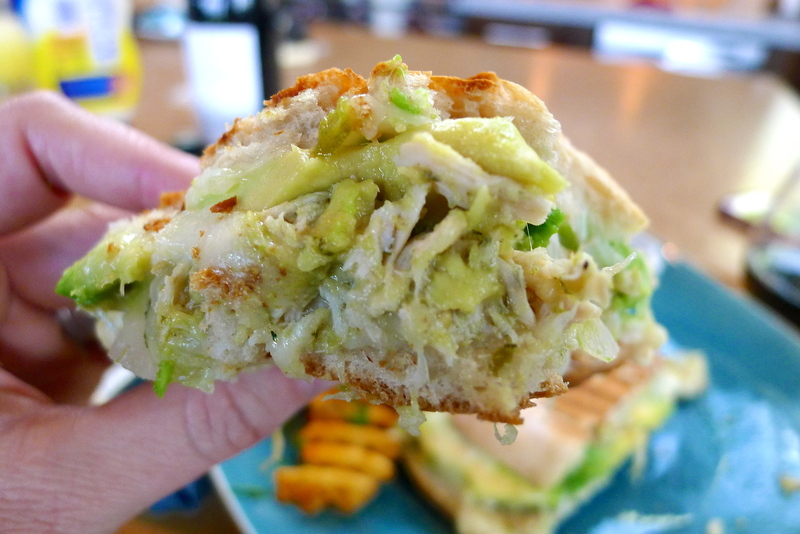 And if some of the panini filling spills out, just scoop it up with a fork (or a waffle fry)! 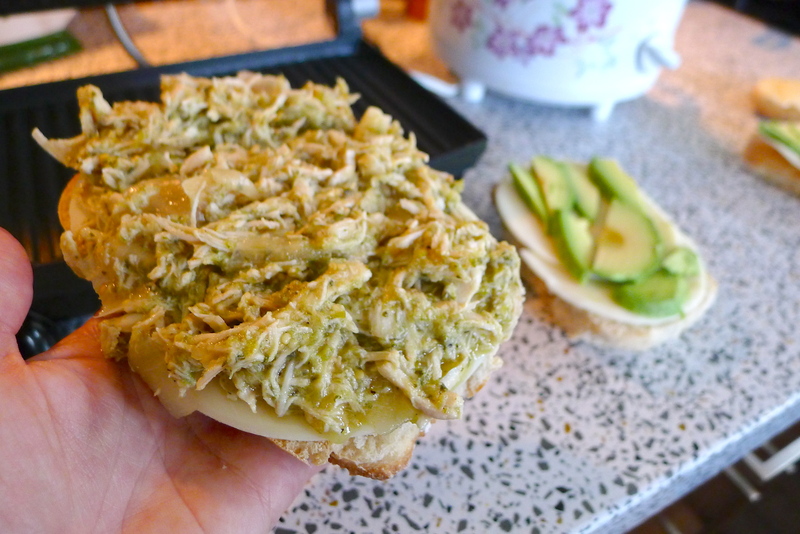 The only bad thing about these chicken chile verde panini is that I’m all out of salsa verde. Sounds like a rainy day recipe to me…time to stock up! 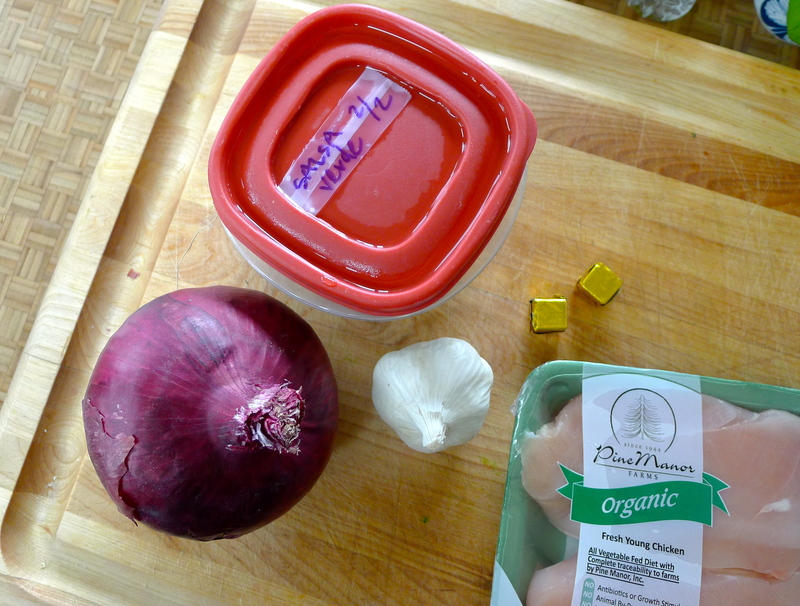 Place the chicken in a small crockpot. 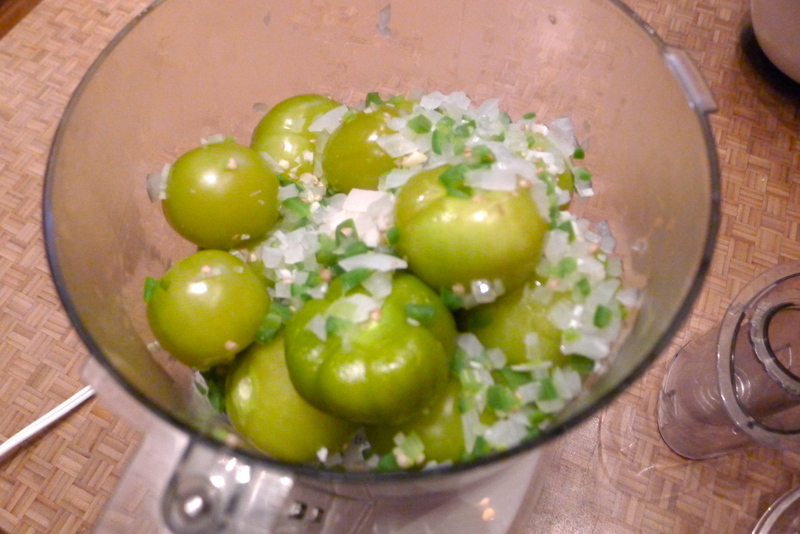 Add the onions, garlic, salsa verde, and bouillon cube. 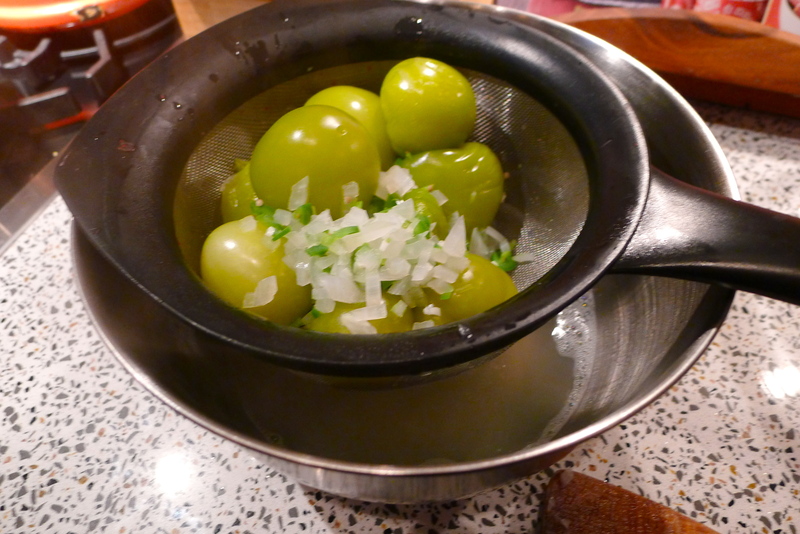 Add a pinch each of salt and pepper. Cover and cook on LOW for four hours. 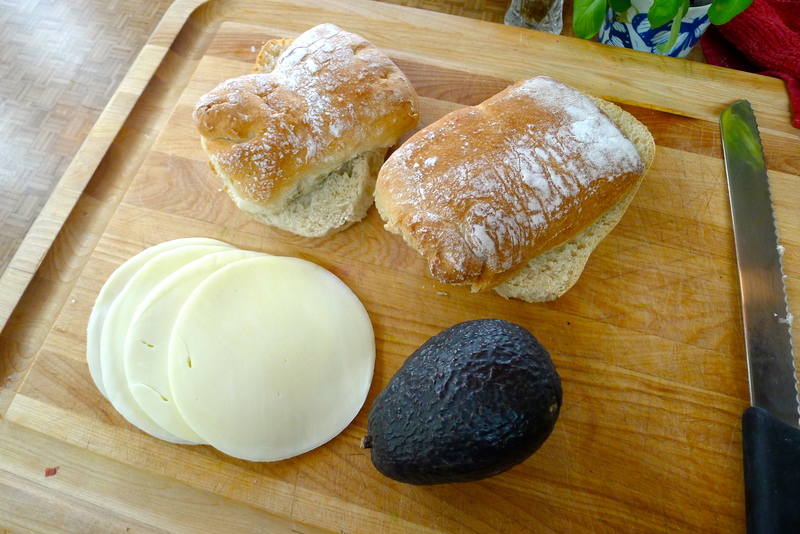 Lay out four pieces of sliced baguette and place the cheese on all pieces. 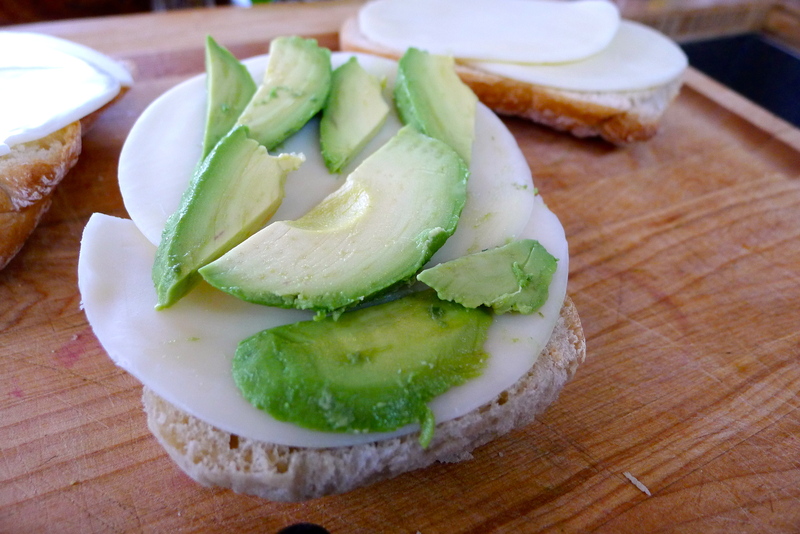 On two pieces, add the avocado. 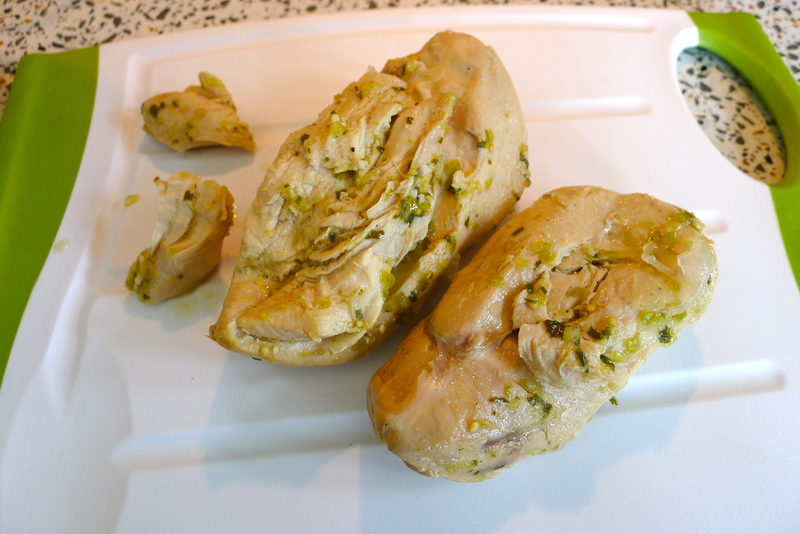 On the other two pieces, pile some of the chicken, using tongs and allowing the liquid to drain off first. 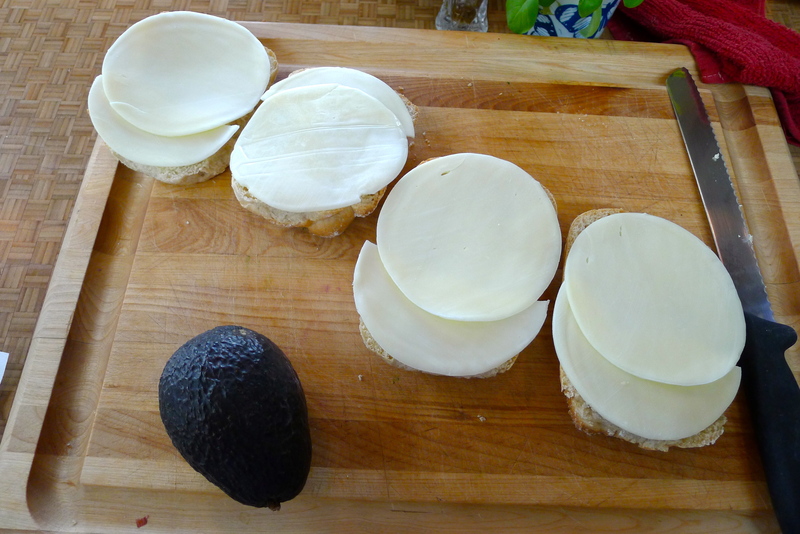 Put the pieces together to make two sandwiches and place them on a hot panini-maker. 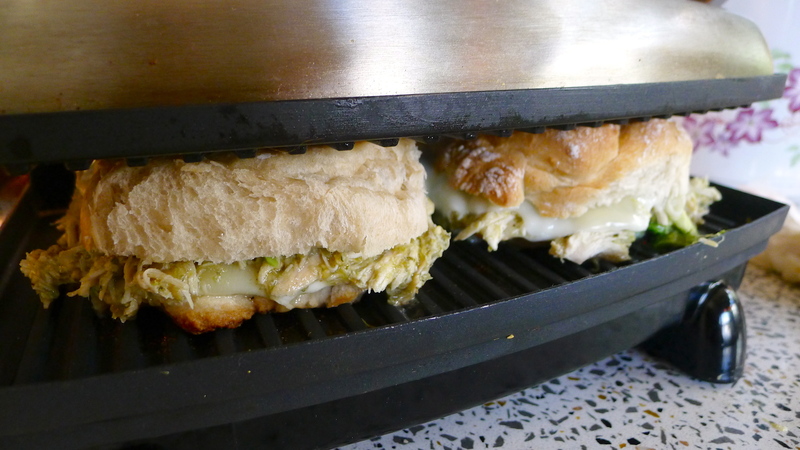 Grill the sandwiches until the cheese is melted and gooey. Eat immediately so the bread doesn’t get soggy (as if you could wait). Cheers to comfort food after Memorial Day. YUM!